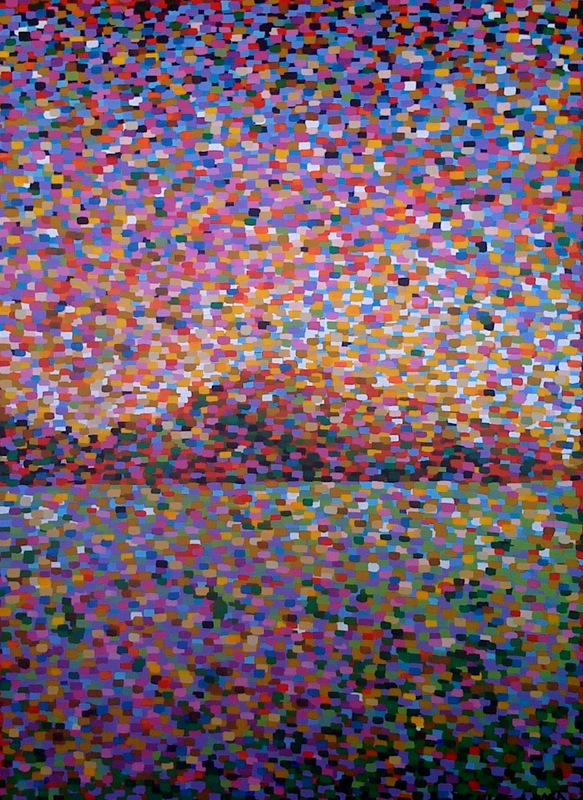 I recently had an art colleague describe my modified pointillism paintings as blotulism inferring that I blot my canvas vs. painting with dots. Very apropos considering looking at my work can make you queasy… much like botulism! If they stayed around long enough, they would see how each new color adds more depth and personality. I actually love seeing my “Face Art” come to life. Pointillism is perfect for showing that special “twinkle” in the eyes. There is an energy that exudes from the work. Sometimes it makes me feel comfortable and sometimes it makes me feel uneasy. I currently have my portrait of a Rodeo Clown hanging in my bedroom. Last night, my husband said, “That guy is creeping me out!” I don’t think it is a fear of clowns but simply that “energy” that pointillism brings to life. What do you think? Any rodeo enthuisiasts out there want to buy him? He needs a new home. LinkedIn is designed as a competitive environment. You make connections with people as you exchange thoughts. Your number of connections can either promote more connections and/or readers, as well as, a lack of connections can dissuade others from reviewing your profile and taking you seriously. So you have to keep building connections. I also read & respond to the discussions of various LinkedIn Professional Groups I’ve joined. I am frequently motivated to “move” on ideas they promote. I have done more to market myself since LinkedIn than I ever would have imagined prior to joining. The Pointillism Painters Group on LinkedIn was my brainchild. It currently has a meager four members of pointillism artists whose works are diverse but I anticipate many more will surface, and soon! I also read what my actual “real-life friends” are doing on LinkedIn. They motivate me to action too. I want to stay “up on what’s happening” and not let others pass me by; thus, the competition. It’s healthy though! So, when my new “Soiree LinkedIn Friend” said “I haven’t spent enough time on My Profile“, I knew he needed some motivation to get the most out of LinkedIn. It’s obvious that he also knows the competitive nature of this social network. Thus, the implied apology… So, this whole blog is for “you”. I’m glad we met in person and I hope to “connect on LinkedIn” in the future. Good luck! Wanted to share an article in today’s local paper. How shall I describe my work? My acrylic paintings are inspired by the “hot southwest” and “cool pacific coast” locals with various characters or flora from each. 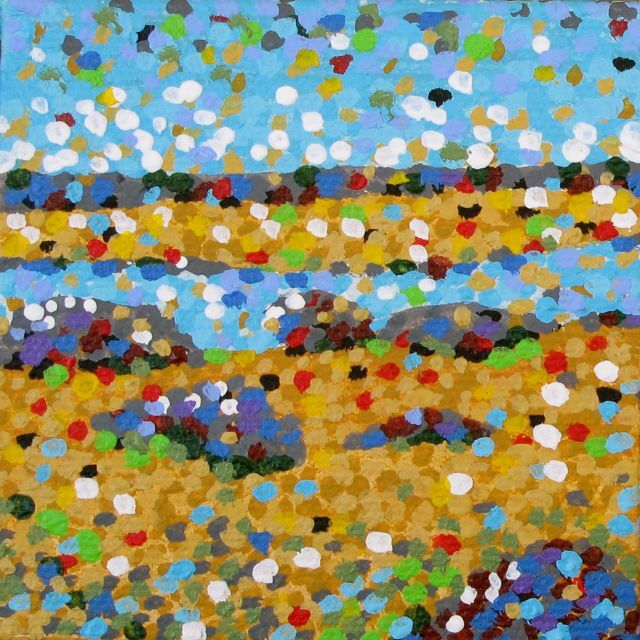 I focus on a style inspired by the color theory of pointillism and use either rounded dots in various sizes or large rectangular brush strokes. They tend to “smother” the whole canvas. My paintings are abstract images utilizing bright colors that “play” with the viewers eyes. My painting studio is anchored with the sounds of musical rhythms that keep my brush moving to the beat so that I don’t get caught up in the making of each mark. Painting becomes an internal chant, repeating the same action over and over. If the music stops, I hum. I focus more on the process of color placement vs. the actual subject itself. I have to “step back” to really see what it is I’m painting; sometimes spending the whole day without really looking at the image until I’m ready to stop. Then my critical eye tells me where to focus the next time I start up. My art studio is private and at the edge of the Goldfield Mountains in central Arizona. While trekkers roam the area, still “look to the hills for gold”, I’ve found my on little goldmine where creating art is a meditative bliss. Being creative is my gift to me. My hope is that others will experience a sense of spontaneity and freedom from my work. 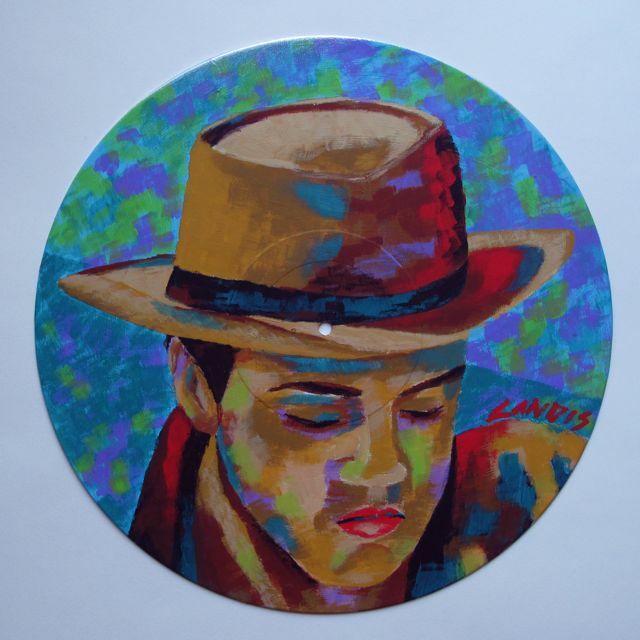 If you are near Long Island City this Friday, check out my Elvis paintings on vinyl records at APW Gallery, www.apwarts.com. The exhibit “Art on Record Volume II” will have it’s opening reception from 6-9pm. Each of my Elvis paintings are priced at only $250! Wow! Check them out. It should be a great exhibit! Have you ever joined an art project sponsored by a gallery? Sometimes it’s good to have external “structure” in the creative process. I’ve researched many online gallery projects and found that the Art House Co-op Canvas Project is a fun way for me to stretch out of my “art box” and challenge my left brain/right brain skills. In joining the co-op, I’ve made friends with artists in numerous countries and even a few from the other side of the Phoenix metro area. It has a huge following all over the world. Hmm… I gave up on the search. The closest definition I could “personally” generate was “creek stone” so I decided this would be my painting subject. Who would know where I got this definition anyway? THEN…..I read in the project’s instructions… that some words are computer generated and NOT WORDS AT ALL. Good grief! That explained everything! The instructions suggested, “Just make up your own definition in this case.” Done! I felt totally confident in my definition of the word “chriksteen”. “Creek stone” conjured up a familiar visual image. In Arizona, you see rounded river rocks in the typical desert landscaping in neighborhood after neighborhood of metro Phoenix. I also thought of the millions of river rocks in and along the Salt River in Central Arizona. In many places, the Salt River has no water at all, just a huge dry riverbed full of these round gray-toned rocks. However, the Salt River always flows in the mountainous area near my home where rafters and “tubers” abound. I chose this image to paint using my pointillism technique. My “chriksteen” image is now on canvas; as are the four other miniature “word paintings”. I can’t wait to participate in future Art House Co-op projects. It’s been good for me to “stretch” on many levels. I encourage other artists to check out www.arthousecoop.com. Reaching out for answers can be fun too.